William Jefferson Clinton, the 42nd president of the United States, was born at the Julia Chester Hospital on the 19th of August 1946 in the small town of Hope, Arkansas as William Jefferson Blythe III, named for his late father who had died in an auto accident in May. He lived in this comfortable frame house in Hope with his widowed mother and her parents for four years after his birth in 1946. Clinton remembered playing in the yard with friends and learning from his adored grandfather about social justice and the equality of all people. Clinton, the first Baby Boomer elected to the White House, maintained a centrist political stance. The American people enjoyed a great economic boom during his administration, and President Clinton worked effectively for peace in Northern Ireland, Haiti, the Middle East, and the former Yugoslavia. He also faced impeachment but was acquitted of the charges brought against him. The Clinton Birthplace Foundation, Inc. preserved the two and one-half story frame house as Bill Clinton’s 1st Home Museum. The home has deep projecting eaves and a broad one-story hipped roof porch on the front. Its style is American foursquare, so called because of its square floor plan. There are many foursquare houses in towns and cities across the country, most built during the early years of the 20th century. The Clinton house dates from 1917. 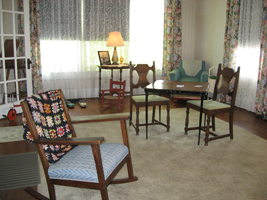 The Cassidy family moved into the home in 1938, when Virginia was in high school, and purchased the house in 1946. The restored interior still has much of its original detail, including the staircase in the living room, with its turned balusters and massive, paneled newel post. A small pantry features built-in cupboards. Virtually all of the second floor finishes are original, including the flooring and the beaded board in the hallway and nursery. Virginia received her R.N. certification in nursing in Shreveport, Louisiana where she met and married William Jefferson “Bill” Blythe II in 1943. He was a traveling salesman from Sherman, Texas. He served in Italy during WWII. Virginia returned to Hope, living with her parents and awaiting her husband’s return. In 1945, Bill Blythe and Virginia lived briefly with her parents before moving to Chicago for his work. Virginia was already expecting; she and Bill wanted to return to Hope for the birth of their child. He insisted she fly back and he would drive to meet her. Tragically, he died in an auto accident en route to Hope. Exhibit at the 13th St. home, visible through porch windows. Young Billy lived with his widowed mother in the comfortable frame home with his grandparents, Eldridge and Edith Grisham Cassidy. He remembers playing in the yard with friends and cousins. In 1948, Virginia, a registered nurse, went to New Orleans for her certification as a nurse-anesthetist. She left her two-year-old son in the care of her parents. They visited back and forth during the months Virginia was away. Bill’s maternal grandparents and extended family played an important role in his childhood. His grandmother taught him his numbers using playing cards pinned to the kitchen curtains. He lived with his grandparents for four years and maintained a close relationship with them, visiting frequently until his grandfather’s death in 1956. Virginia finished her schooling and returned to Hope in 1950. Soon she met and married Roger Clinton from Hot Springs, Arkansas. They moved a short distance away to a house of their own at 321 E. 13th Street. 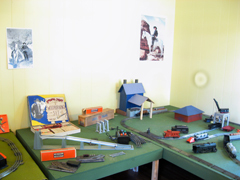 Bill enjoyed his Lionel trains and was keen on Hopalong Cassidy. He attended first grade at Brookwood Elementary. In 1953, the family moved to Hot Springs, Arkansas where his mother continued her nursing, and his stepfather worked with the family car dealership. From 1953-1955 young Bill attended St. John’s Catholic School and then public schools. Bill adored his younger half-brother, Roger who was born in 1956. When Roger started school, Bill asked to change his name to Clinton so everyone would know the two boys were brothers. Bill Clinton completed high school in Hot Springs, excelling in many areas. Bill won the American Legion essay contest. During the Boys’ Nation trip to Washington, DC, he shook hands with President Kennedy. This experience reinforced his growing interest in politics and public service. Bill had a large extended family that encouraged him, and he was fortunate to meet many mentors along the way, including Senator Fulbright. Bill Clinton graduated from Georgetown University in 1968 and won a Rhodes Scholarship to attend Oxford University in England. He returned to the United States to go to Yale Law School. While there he met Hillary Rodham. After graduating from law school, he taught at the University of Arkansas Law School. He and Hillary married in 1975, and she also taught at the law school. Bill Clinton entered politics after heading Senator McGovern’s presidential campaign in Texas. He first served as Attorney General of Arkansas in 1976. He was elected Governor of Arkansas in 1978, the youngest governor in the nation at 32. Clinton pursued a liberal agenda. Defeated two years later, he moved to the centrist political stance that would characterize the remainder of his political career. Regaining the governor’s office in 1982, he served a total of five terms. After ten years as a very popular governor, Bill Clinton won the presidential race in 1992. Many leading Democrats chose not to run in the presidential election of 1992, assuming that President George H. W. Bush would easily win reelection for a second term. Clinton, sensing opportunity, announced his candidacy in 1991. President Clinton and his vice president, Albert Gore, Jr., represented a new political generation, the men and women born after World War II. The Democrats swept the election, taking control of both the White House and Congress for the first time in 12 years. During the Clinton administration, the nation enjoyed the lowest unemployment and inflation in modern times, reduced welfare rolls, falling crime rates in many places, and the highest home ownership in the country's history. President Clinton proposed the first balanced budget in many years and achieved a budget surplus by lowering government spending and increasing taxes of the wealthiest 1.2% of Americans. He sought to end racial discrimination, improve education, and strengthen environmental rules. A major initiative of the Clinton administration was an ambitious health care reform plan, led by First Lady Hilary Clinton. The administration’s plan was defeated on Capitol Hill. Clinton was an effective peacemaker internationally, although he had little foreign policy experience. Tragedy marred President Clinton’s first term, when a rescue mission in Somalia begun by President Bush ended with the deaths of 18 American servicemen. He acted as a mediator during peace negotiations between Ireland, Great Britain, and the Irish Republican Army. He brought the leaders of Israel and Palestine together at the White House, where they signed a peace accord in 1995. He dispatched peacekeeping forces to Bosnia and bombed Iraq to enforce United Nations inspections of Saddam Hussein’s nuclear, chemical, and biological weapons programs. President Clinton successfully negotiated the North American Free Trade Agreement, which boosted both the American and Mexican economies. In 1995, the peace accord signed in Dayton, Ohio, led to a U.S. and NATO-backed cease-fire in the Balkans. Clinton was popular as a “New Democrat,” but the tide began to turn in 1994, when the Republicans took over both houses of Congress, and personal scandal rocked his administration. He won reelection in 1996, but, in 1998, was the second sitting president impeached in the House of Representatives, where he was tried for charges relating to personal indiscretions with a White House intern. He became the first elected president to be tried by the Senate. After the Senate found him not guilty of perjury and obstruction of justice, Clinton apologized to the nation. The non-profit Clinton Birthplace Foundation, Inc. acquired the home in 1994 and opened the restored house to the public three years later as President Bill Clinton’s 1st Home Museum & Exhibit Center. The foundation added The Virginia Cassidy Blythe Clinton Kelley memorial garden to honor Bill’s mother. 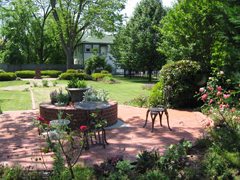 The Museum Exhibit Center is adjacent to the home and garden, with exhibits on Clinton’s childhood, personal and political life, family history, and friends from Hope. It also houses a museum store with Clinton’s favorite books and Fair Trade craft items reflecting the Clinton Global Initiative as well as political memorabilia and heritage souvenirs. In 2011, the home was officially designated as a National Historic Site in the National Park System. President Bill Clinton's 1st Home Museum, a unit of the National Park System, listed in the National Register of Historic Places as the Bill Clinton Birthplace, is located at 117 S. Hervey St., Hope, AR. It is operated by The Bill Clinton Birthplace Foundation. The museum’s complex of buildings is located 1.4 miles SE of IH-30 in downtown Hope. Parking and entrance is in the back, off 2nd St. The museum is open Monday-Saturday 10:00am to 5:00pm and by reservation. The grounds and exhibits are accessible at no charge, and guided tours of the inside of the home are available for a small fee. For more information, visit the President William Jefferson Clinton Birthplace Home National Historic Site website or the Clinton Birthplace Foundation's Clinton Childhood Museum website. The foundation also owns the small house at 321 E. 13th in Hope, where young Bill lived with Virginia and Roger Clinton. There are no tours inside but exhibits are visible through the porch windows.